It’s the place where glasses clink and eyes meet. A twinkle in the eye of an old friend. A glimmer of something special when strangers cross paths. Start the day with a selection of award-winning premium coffees and curated breakfast or lunch fare. 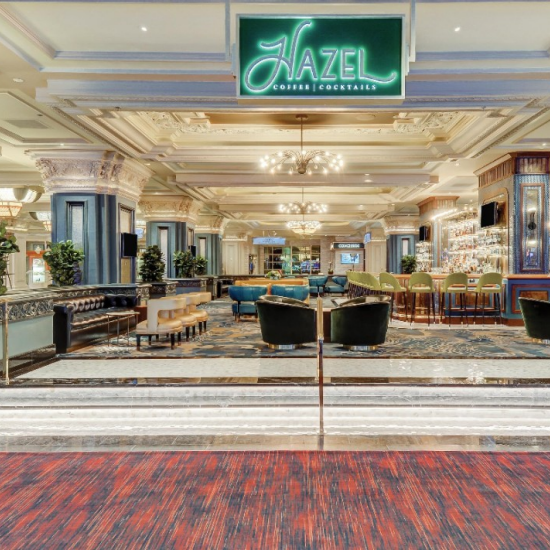 When the sun goes down, peruse Hazel’s distinctive cocktail menu for a range of time-honored classics as well as adventurous new creations. Walk past guest elevators to the casino floor and follow the pathway along the left hand side. Continue walking straight and Hazel will be on the right-hand side. Enter the doorways from the garage area and proceed on cobblestone walkway. Follow pathway as it veers to the right. Take left onto casino floor. Hazel will be on the left-hand side.